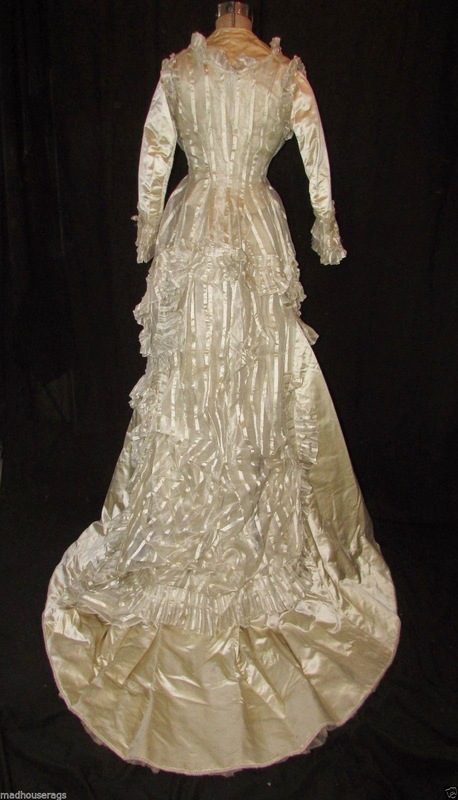 Just a wonderful 1870s three piece bustle gown, most likely worn initially for a wedding. 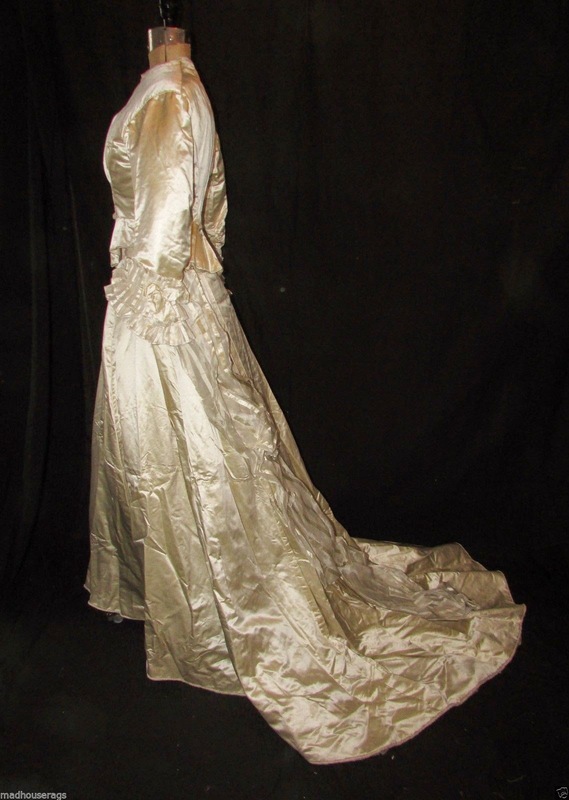 The two piece main gown is of an ivory silk satin. 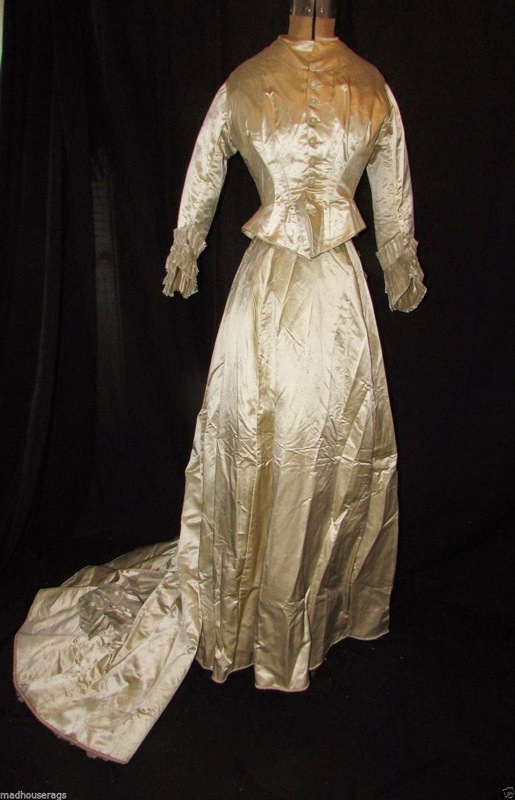 It has wide sleeves with elaborate pleated rows of organdy with a satin stripe, along with silk bows. It has a tapered waist, and flares at the hip, there is padding going from the underarms to the sides of the bust. It fastens with thread buttons, is lined with cotton. The skirt is pleated off to one side in back. 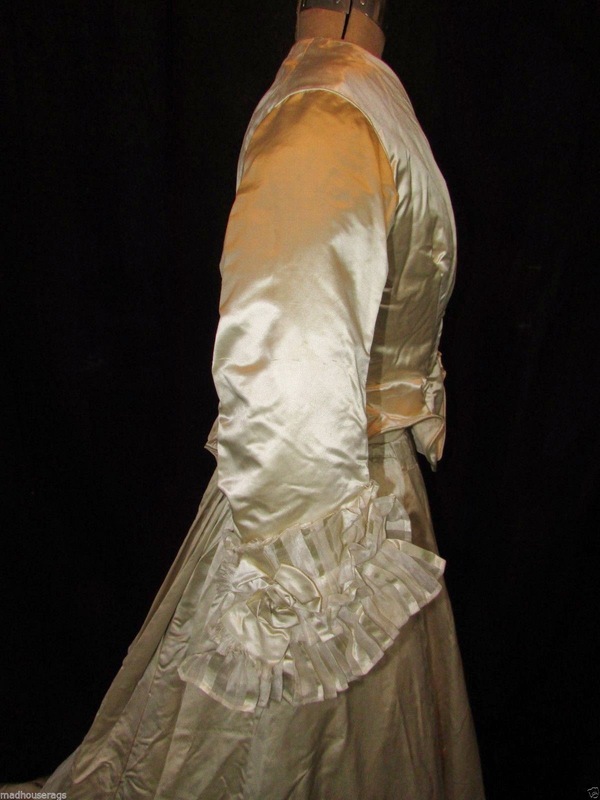 There is also a wide band of striped organdy that starts at the waist and continues down almost to the end of the train. 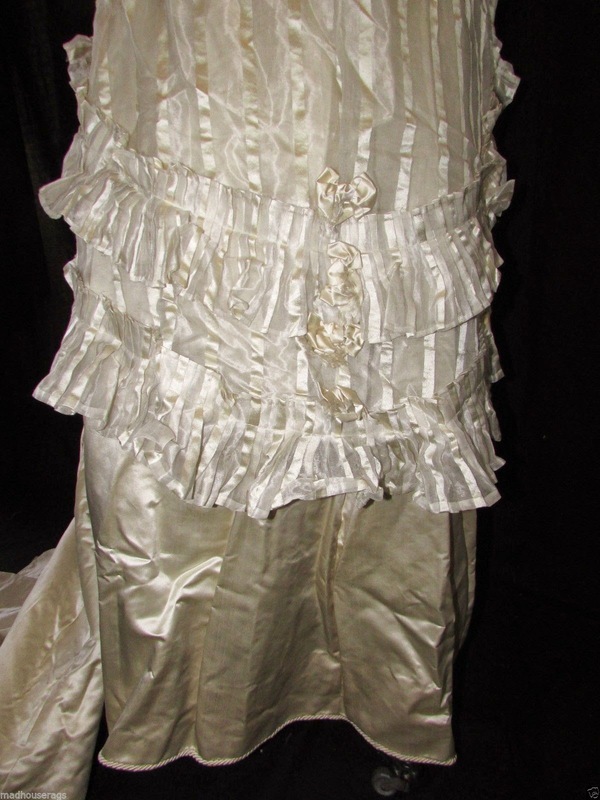 The skirt fastens with hooks and eyes, is lined with stiffened cheesecloth, has a twirled rope type binding at the hem. 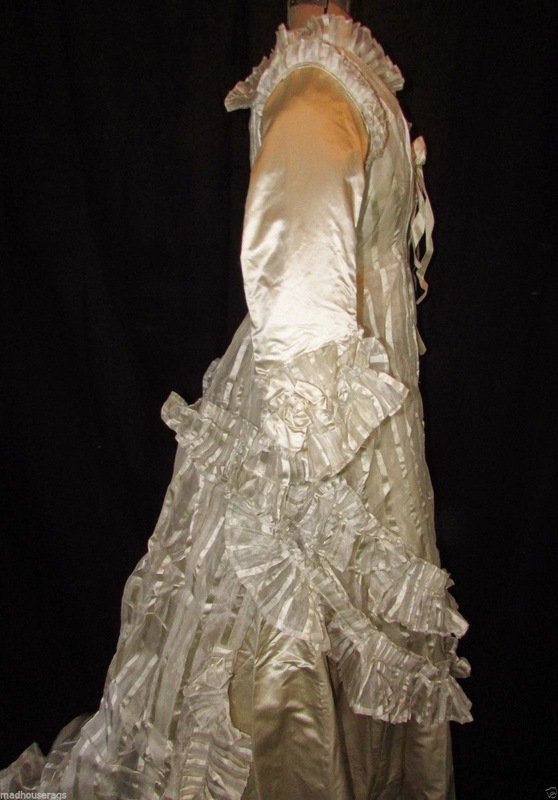 The sheer overdress is sleeveless, is of the same striped satin and organdy fabric at the sleeves of the main gown. 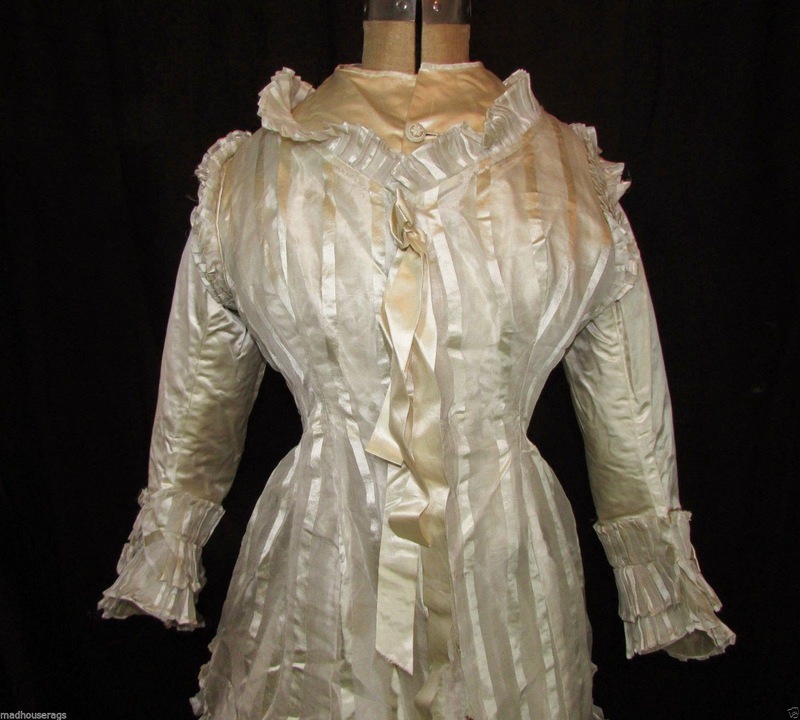 It also has satin bows, rosettes, and ruffles to match the sleeves. There are black tapes inside the train to shape it, it fastens in front with hooks and eyes. The bust on both pieces is about 34", waist is about 26". The skirt is about 41" long in front, 63" in back, to the end of the train. Sorry to have omitted the rest of the measurements, they will be added tomorrow in the afternoon. 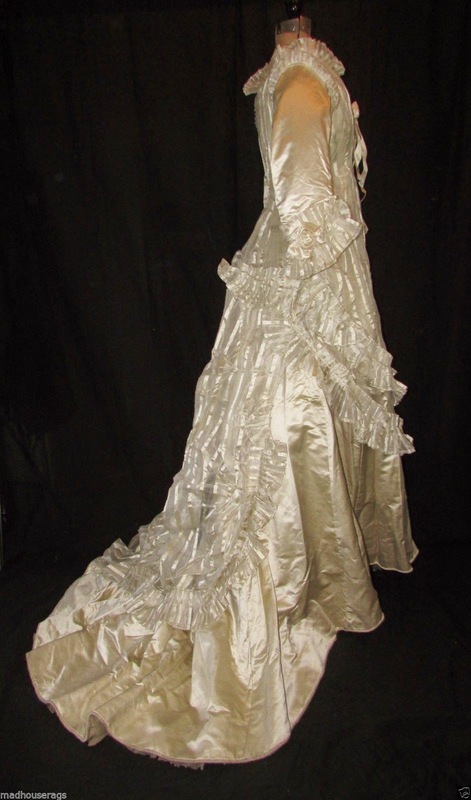 I have not used any bustles or padding while photographing the gown. 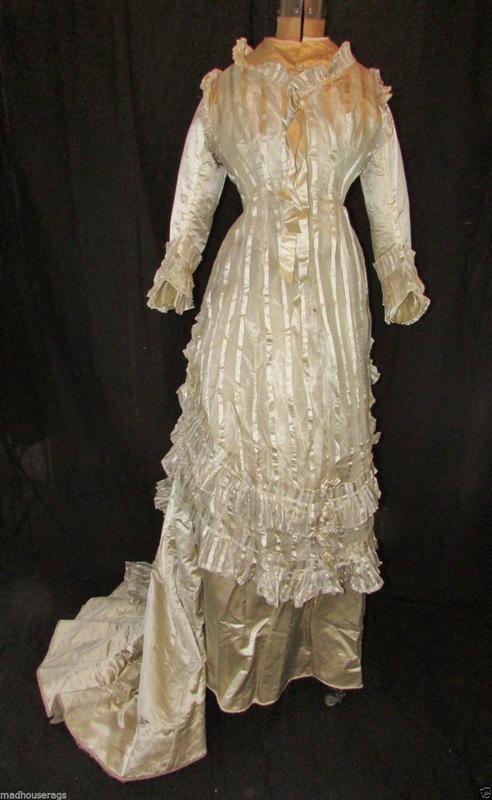 In very good condition, with no flaws to the bodice that I can detect. The skirt has one 14" light spot on the front, 5-6 others that are tiny. There is one 1 1/4" x 1/4" area with some light brownish spotting, this is at the top of the skirt, and is somewhat hidden by the organdy band. There might be some other, very minor spots here and there. The organdy has 3" x 3" area with some discoloration, 2-3 tiny holes. All pieces are strong, with no splitting or major stains, underarms are clean. International bidders please be aware that you might be charged additional postal or customs duties that I have collected. Please contact your local post or customs office with questions about these charges. 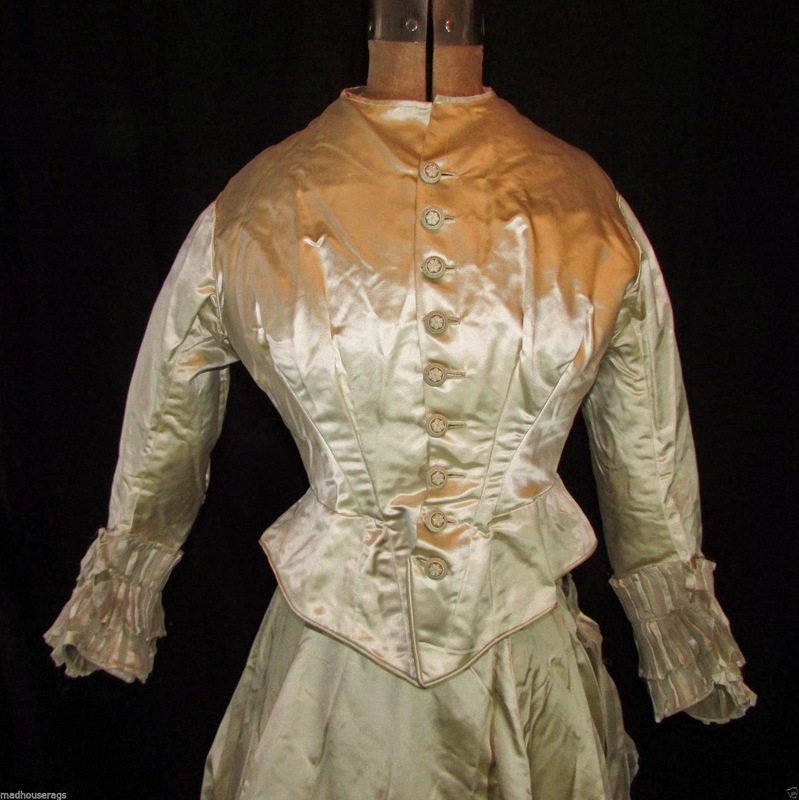 The bodice measures about 27" around at the waist, it's 1" between the shoulder seams in back.The skirt has a 27" waist, is 41" long in front, 61" long in back at the train. Thanks! I really think that the sheer dress wasn't meant to be worn with the satin dress. 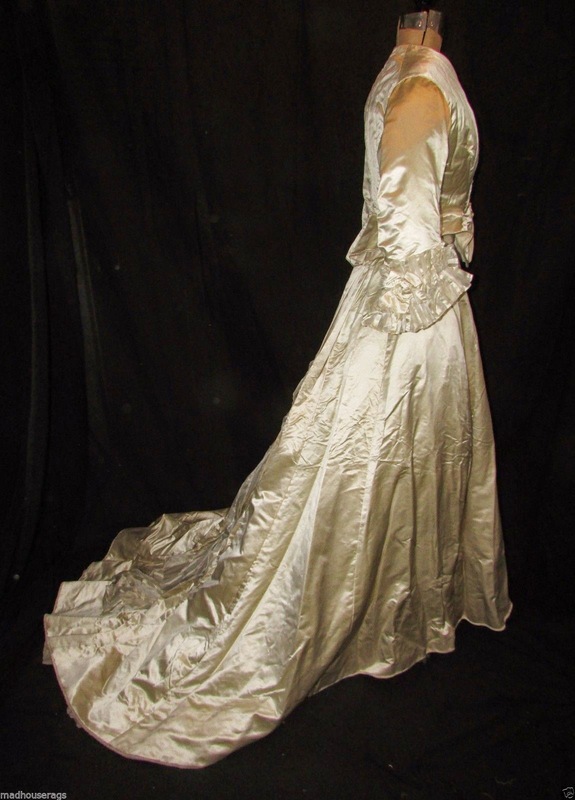 The satin dress is a good five to seven years earlier than the sheer dress. The sheer dress also looks like it's probably Natural Form whereas the satin dress isn't. They may have been made for the same lady but they weren't meant to be worn together. 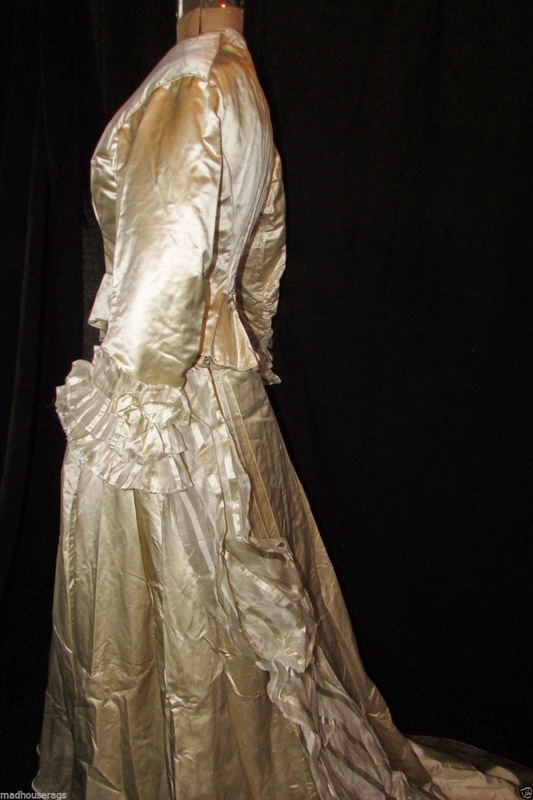 The satin dress is very early 1870's while the sheer one is probably more 1877/78. That they did! I wish ebay would go back to letting you see the full username of at least the winning bidder. I know there was a lot of bidding wars simply because of infighting - which is why they switched to this system- but really!